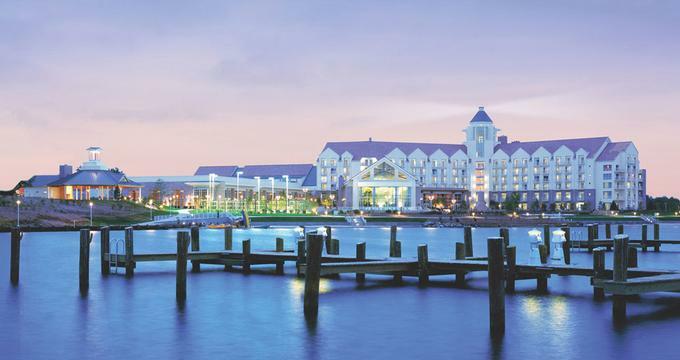 Resting on the banks of the Choptank River, Hyatt Regency Chesapeake Bay Golf Resort, Spa and Marina offers guests an unparalleled Eastern Shore experience. Based in Cambridge, Maryland, the 342-acre resort presents a charming location for every occasion, from a fun-filled family vacation or a romantic getaway for two to a stylish business retreat or conference. The upscale resort and spa boast luxurious accommodations with private balconies and beautiful views, unrivaled services and amenities, including an 18-hole championship golf course designed by Keith Foster, an exclusive spa and salon and temperature-controlled indoor and outdoor swimming pools. The resort also offers over 122,000 square feet of indoor and outdoor event and function space for every occasion, six restaurants, and bars, and provides unique extras such as the fully supervised Camp Hyatt for children. 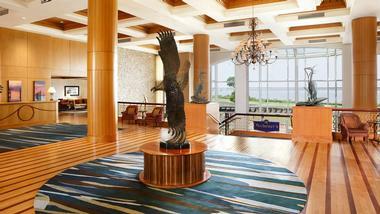 Hyatt Regency Chesapeake Bay Golf Resort, Spa, and Marina is conveniently located within a few miles from the Richardson Maritime Museum and Bill Burton Fishing Pier State Park. 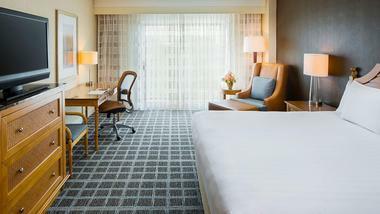 Hyatt Regency Chesapeake Bay offers luxurious accommodations in the form of 400 guest rooms and suites with sweeping views of the Choptank River. All lodgings feature premium amenities, including luxurious Hyatt Grand Beds®, elegant bathrooms with marble baths, glass-enclosed showers, plush bathrobes and KenetMD™ bath products, flat screen HD televisions with cable/satellite channels, individual climate control, and in-room coffee makers. Extra room amenities include hairdryers, iron and ironing boards, mini fridges, clock radios, in-room safes, telephones with voicemail services, and data ports for high-speed Internet access. Complimentary high-speed wireless Internet is available throughout the hotel. Luxurious Regency Club Rooms offer guests access to the exclusive Regency Club® Lounge, which serves complimentary continental breakfast, snacks and beverages throughout the day and light hors d’oeuvres and desserts in the evenings. King or Double Standard Rooms are 350 square feet in size and enjoy sweeping resort views through large floor-to-ceiling sliding glass doors. These spacious, well-appointed guestrooms are available with one king-size or two double signature Hyatt Grand Beds® dressed with designer bedding, luxurious linens, and soft pillows. Standard Rooms have private en-suite bathrooms with elegant marble baths and showers, plush bathrobes and KenetMD™ bath products while modern amenities abound in the sunny, spacious sitting areas. A separate work area features a work desk with dual-line phones with voicemail services, data port, and message light, and access to both wired and wireless high-speed Internet. Additional amenities include flat screen HD televisions with cable/satellite channels, individual climate control, in-room coffee makers and mini-fridges, and a complimentary morning newspaper. Water View Rooms are 350 square feet in size and are available with or without private balconies. Water View Rooms feature one king-size or two double signature Hyatt Grand Beds® dressed with pillowtop coverings, designer bedding, luxurious linens and soft pillows. Private en-suite bathrooms enjoy both showers and marble baths and showers and offer plush bathrobes and KenetMD™ bath products. Spacious sitting areas boast beautiful wood furniture that reflects the ancient seafaring heritage of the surrounding coastline, and large floor-to-ceiling sliding glass doors embrace stunning views over the marina, the swimming pool complex, and the Choptank River. Plush armchairs and ottomans offer comfortable seating, and state-of-the-art amenities such as flat screen HD televisions with cable/satellite channels, and access to both wired and wireless high-speed Internet provide ample entertainment. Additional amenities include individual climate control, in-room coffee makers and mini-fridges, and a complimentary morning newspaper. Water View Balcony Rooms provide spacious private balconies with breathtaking water views of the Choptank River and feature one king-size or two double beds, as well as all the same amenities as the Standard Water View Rooms. Regency Club Rooms are located on the top floor of Hyatt Regency Chesapeake Bay, and all enjoy spectacular sweeping views of the Choptank River and surrounding landscapes. The exclusive and luxurious Regency Club Water View Rooms are offered with one king-size or two double signature Hyatt Grand Beds® dressed with designer bedding, luxurious linens and soft pillows and private en-suite bathrooms that feature elegant marble baths and glass-enclosed showers, plush bathrobes, and KenetMD™ bath products. Stunning sitting areas are decorated in contemporary furnishings with wood-burning fireplaces, state-of-the-art surround sound systems and separate work areas with desks and both wired and wireless high-speed Internet. Plush armchairs and ottomans offer comfortable seating, and modern amenities such as flat screen HD televisions with cable/satellite channels, individual climate control, in-room coffee makers and mini-fridges, and a complimentary morning newspaper. Large floor-to-ceiling sliding glass doors open onto private balconies and embrace gorgeous views over the marina, the swimming pool complex, and the Choptank River. Additional services for guests staying in the Regency Club Rooms include concierge services during regular hours and private concierge services after-hours, video checkout and ‘Pack ‘n Play’ cribs upon request. Regency Club Rooms offer guests access to the exclusive Regency Club® Lounge, which serves complimentary continental breakfast, snacks and beverages throughout the day and light hors d’oeuvres and desserts in the evenings. Resort View King Family Petite Suites are 550-square-foot suites that boast sweeping vistas of the resort and the Choptank River through large floor-to-ceiling sliding glass doors that open onto private balconies. Spacious separate sitting areas are tastefully decorated with contemporary furniture, plush armchairs, and sofas provide comfortable seating for up to six guests, and modern amenities include two flat screen HD televisions with cable/satellite channels, in-room coffee makers, and mini-fridges, and a complimentary morning newspaper. Separate work areas have work desks with dual-line phones with voice mail, data port and message light and high-speed Internet access while bedrooms have king-sized signature Hyatt Grand Bed®, fitted with designer bedding, luxurious linens, soft pillows.Private en-suite bathrooms feature elegant marble baths and glass-enclosed showers, plush bathrobes, and KenetMD™ bath products and individual climate control and ceiling fans keep the suite cool. Waterview King and Double Petite Suites are 550-square feet in size and feature separate bedrooms and sitting areas. Sunny lounge areas enjoy sweeping views of the resort and the Choptank River through large floor-to-ceiling sliding glass doors that open onto private balconies, and tasteful furnishings include plush armchairs and ottomans. Separate work areas have work desks with iHome service, dual-line phones with voice mail, data port and message light and high-speed Internet access while bedrooms have king-sized signature Hyatt Grand Bed®, fitted with designer bedding, luxurious linens, soft pillows. Private en-suite bathrooms feature elegant marble baths and glass-enclosed showers, plush bathrobes, and KenetMD™ bath products and individual climate control and ceiling fans keep the suite cool. Modern amenities in the Waterview King and Double Petite Suites include hair dryers, iron and ironing boards, mini fridges, clock radios, in-room safes, telephones with voicemail services, and data ports for both wired and wireless high-speed Internet access. The ultra-luxurious Chesapeake Suites offer between 400 and 1,200 square feet in space with private balconies and beautiful views. Living room parlors feature comfortable sofa beds, dining room tables and chairs for up to six guests and large floor-to-ceiling sliding glass doors that open onto private balconies. Rooms connect to one or two bedrooms with king-size or two double signature Hyatt Grand Beds® dressed with designer bedding, luxurious linens and soft pillows and private en-suite bathrooms feature elegant marble baths and glass-enclosed showers, plush bathrobes, and KenetMD™ bath products. Separate work areas with desks and both wired and wireless high-speed Internet and modern amenities include iHome services, flat screen HD televisions with cable/satellite channels, individual climate control, in-room coffee makers and mini-fridges, and a complimentary morning newspaper. The Chesapeake Suites can be booked in a one/two bedroom configuration with either Resort or Water views. Hyatt Regency Chesapeake Bay Golf Resort, Spa, and Marina is home to several restaurants and bars that serve a range of cuisine from traditional Eastern Shore specialties to fresh seafood and regional fare. Bay Country Market is the best spot to begin the day with a freshly brewed cup of Starbuck’s coffee and sweet pastry or to grab a light snack or meal throughout the day. Eagles Nest Bar & Grille is a great spot for a handcrafted cocktail or light meal after a round of golf while the Dock’s Poolside serves an array of freshly prepared salads, sandwiches, appetizers and lunch items throughout the day. Sip signature cocktails and other colorful beverages from the bar or order in and enjoy a meal in the comfort of your room with the in-room service. The Blue Point Provision Company serves daily fresh seafood, and signature cocktails against a backdrop of beautiful sunsets over the Choptank River and the Water’s Edge Grill serve outstanding regional specialties for breakfast, lunch and dinner from a uniquely designed display kitchen. The Breakwater Pavilion offers a serene setting in which to relax and soak up the beautiful views while Michener's Library is a spectacular lobby lounge with two massive stone fireplaces and an ideal spot for a nightcap. 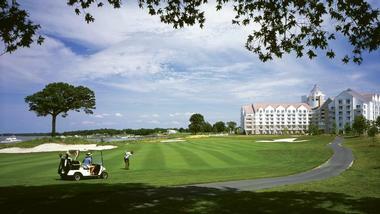 Hyatt Regency Chesapeake Bay Golf Resort, Spa, and Marina offers a variety of top-notch facilities, amenities, and on-site activities. On-site activities at the resort include an 18-hole championship golf course designed by Keith Foster, temperature-controlled indoor and outdoor swimming pools, and a large activity pool with waterslide. Additional facilities include miniature golf, lighted tennis courts, foosball, and air hockey, as well as an exclusive spa and salon and over 122,000 square feet of indoor and outdoor event and function space. A 24-hour fitness center offers state-of-the-art equipment and cardio machines, a free weights section and a stretching area, as well as in-room workout videos, yoga classes and complimentary workout towels, water and fruit. The resort’s River Marsh Golf Club is an 18-hole championship golf course designed by Keith Foster that offers challenging holes and beautiful views over the Chesapeake Bay. The resort’s 150-slip River Marsh Marina offers guests a variety of activities, ranging from overnight docking with electric, cable, and water hookups, wireless Internet, and restrooms, showers and laundry services. 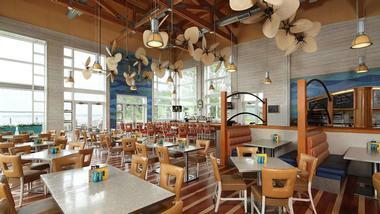 The marina’s store, the Quarterdeck offers a range of boating accessories, groceries, drinks, and apparel. The exclusive full-service Sago Spa and Salon provides a range of pampering body and salon treatments, including massages, facials, haircuts, manicures and pedicures. Named after the underwater grass found in the Chesapeake Bay, Sago Spa, and Salon uses natural, sea-based products inspired by the grass. The spa and salon feature 13 tranquil treatment rooms decorated in nautical-inspired hues and fitted with top-of-the-line equipment. The spa also features a sauna and steam room, an expanded modern salon with hair, make-up and nail stations, and a full retail area. Signature treatments include an Old Fashioned Back Tonic used to unravel deep-rooted spinal muscle tension, the Sago Dreams Body Wrap, the Seasonal Signature Body Glow, and the Oxygenating "O2" Facial. Hyatt Regency Chesapeake Bay Golf Resort, Spa, and Marina offers over 37,000 square feet of indoor space and 85,000 square feet of outdoor areas and terraces for a variety of functions and events. In addition to stylish venues of all sizes, service packages include expert meeting planners to take care of every detail, technology services, and audiovisual equipment, catering, and customized menus, handling of VIP guests, luxurious accommodations and first-rate amenities and premium services. Camp Hyatt at Pirate's Cove is a unique children’s club that offers a fun-filled activities program designed to keep kids occupied, learn new skills, and help them make new friends. Child-friendly activities include s'mores at the Grand Fireplace, scavenger hunts, and miniature golf. Back to: Romantic Weekend Getaways in Maryland, Weekend Getaways from DC.